song book of the Argentina. It was in Tres Arroyos, county of Buenos Aires, where she met the public's first flatteries. As song soloist and guitar arrived at the Capital Federal to fulfill numerous commitments and she was secured in the Argentinean autochthonous music. 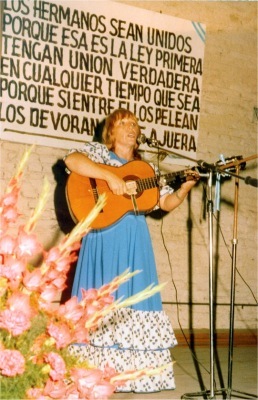 Her temperate voice and her well played guitar took she to participate in many Festivals, Radio, Television and other well-known events of the Argentinean music carrying out extensive tours that almost embraced all the important cities of the country. She was presented in the four television channels of the capital, in the radios Belgrano, El Mundo, Nacional, Municipal, Argentina, etc. and, among other, in the national festivals "Fiesta del gaucho", "Fiesta del trigo" (Party of the wheat) y "Fiesta del agua" (Party of the water). Besides continuing being presented in diverse shows, radio and television, she is author and composer of several topics of our national rhythms, some of them have been recorded by other important interpreters.